This product we offer more as a courtesy to our customers than anything else. Quality 10W30 oils are available everywhere, at local auto supply stores, big box stores, grocery stores, filling stations, heck even drug stores . 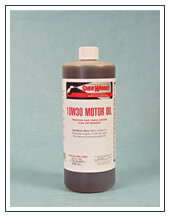 While there are both synthetic and natural 10W30 oils, both must meet exacting standards set by the American Petroleum Institute (API) in order to be sold as 10W30 oils. Ours is a non-synthetic high detergent 10W30 oil. (Note: an oil is said to be a detergent oil when it has additives which keep small impurities in suspension in the oil. This way, the impurities are removed when the oil is changed. Non-detergent oils allow these impurities to settle out of the oil, which allows a sludge to form in the bottom of the engine. Virtually all motor oils today are high detergent oils, and you should always use a high detergent oil in an operating engine for this reason.) Our oil meets ILSAC GF-3 requirements, and is ILSAC certified. It also meets API's SL standards. If you choose to use a synthetic 10W30 oil, it essentially operates the same way as a natural 10W30 oil, but it lasts longer. Synthetics resist high temperatures better, leading to their longer life, but there is little other difference. So, if you choose to use synthetic oil (which is more expensive) change it less frequently. Available is either quart bottles (12 per case), or bulk containers (pails, drums or totes).